We mostly attack zones with a general zone offense and usually that is all we need to do, as long as we execute well and are patient, make the zone shift, and work the ball inside. 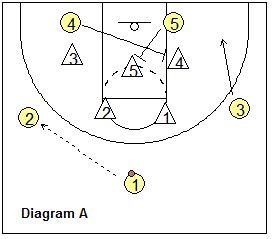 But at times, we will run a set zone play to get someone open for a good shot. In teaching our system, we first teach our basic zone offense(s), and then add a few of these plays as the season progresses. You can screen the zone. An effective method is to swing the ball to one side and then, as the zone shifts, back-screen the weakside of the zone. Note that with any of these plays, if the play breaks down, our point guard should recognize this and resume our usual zone offense. Also, an important part of any zone offense or zone play is offensive rebounding after the shot goes up. 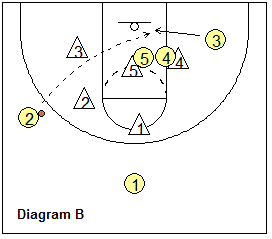 I'll just present a couple plays here... go to 2-3 Zone Offense Plays for many more. We start in our "Zone-23" (1-3-1) set. In diagram A, O1 dribbles a little toward the right and engages the X1 defender. O3 slides a little toward the corner, but not all the way down. 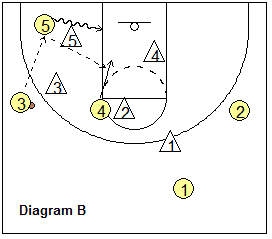 O4 steps out to the arc and gets the pass from O1 (this occupies the top X2 defender). O4 then passes to O3 on the wing, and this pass should get the outside low defender X3 to come out to defend O3. O5 runs the baseline to the ball-side short corner and gets the pass from O3. As the X5 defender moves over to defend O5, O4 quickly cuts inside for the quick pass from O5 and the inside shot (diagram B). We should have a 2-on-1 with O5 and O4 vs the low middle defender X5. But O4 has to cut quickly before that outside low defender X3 can slide back inside. Also, O5 has the options of shooting the short-corner shot, driving baseline to the hoop, or passing to O4 cutting into the paint. 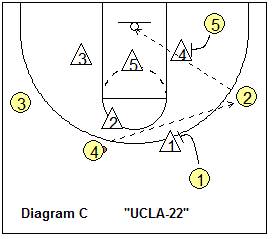 "UCLA-22" - As in "UCLA" above, once again O4 steps out on top for the pass from O1. O5 stays on the back-side and back-screens the low outside defender X4, while O1 back-screens the top outside defender X1. O4 makes the overhead skip-pass to our good shooter O2 for the wide-open 3-point shot. 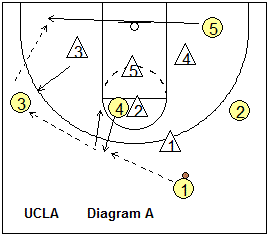 After the skip-pass, O4 and O3 will move inside to crash the offensive boards for the rebound.